After hearing mixed reviews about Fortune’s new ownership from friends and readers, we ventured to this unassuming storefront on a gray weekday and had an utterly transformative lunch. We had heard that the new owners were concentrating on Sichuan cuisine and we sought dishes with the classic mouth numbing Sichuan peppercorn. For the uninitiated, the heat of Sichuan peppercorns doesn’t translate exactly to the Scoville scale; instead, the spice numbs the lips and tongue creating a unique sensation. 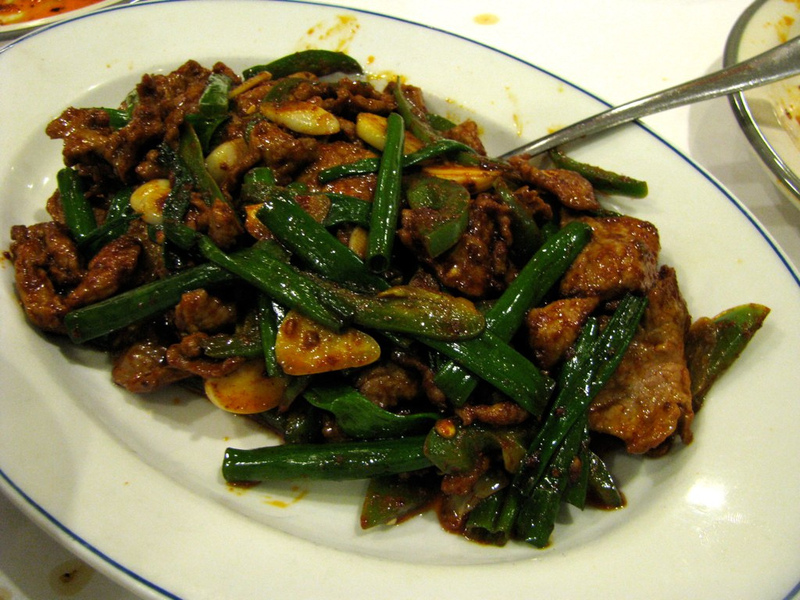 In Chinese, this numbing spiciness is referred to as ma la. We’ve had some great Sichuan dishes around town, most notably some items in the Imperial Garden Weekend Buffet, but Fortune has the most successful and faithfully reproduced versions of typical Sichuan dishes. We started off with two bowls of dan dan noodles (one bowl is plenty to share between two people). This quintessential Sichuan dish has been butchered up and down by Americanized noodle shops and we were a little disappointed to see that it came with egg noodles and not the typical thin flour noodle. By the second bite, we had forgotten the noodle and were completely wowed by the flavors. 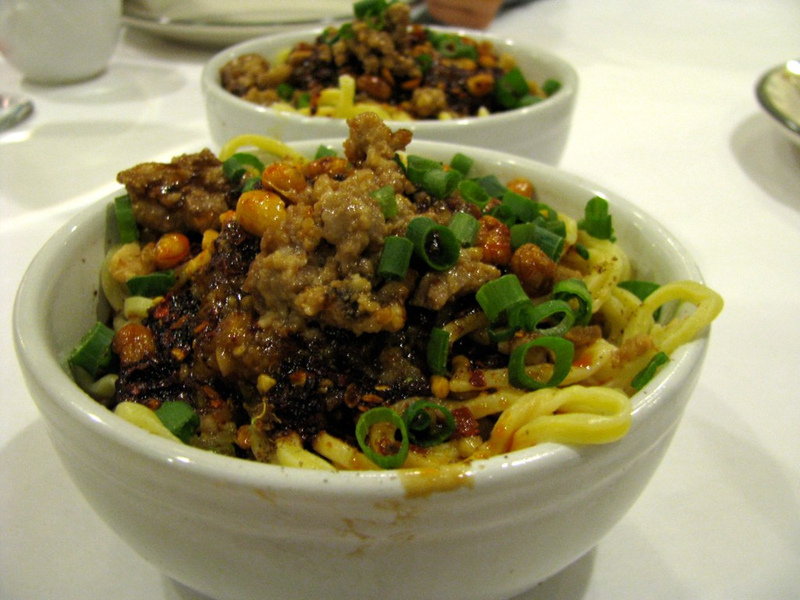 Drenched in chili oil and liberally sprinkled with crisp peppercorn flakes, the ground pork and peanut toppings contributed to the overall flavor and we were substantially impressed. In no time at all, our sinuses were clearing up and our mouths were totally numb. Another dish we couldn’t refrain from ordering was the lamb with chili pepper and cumin. 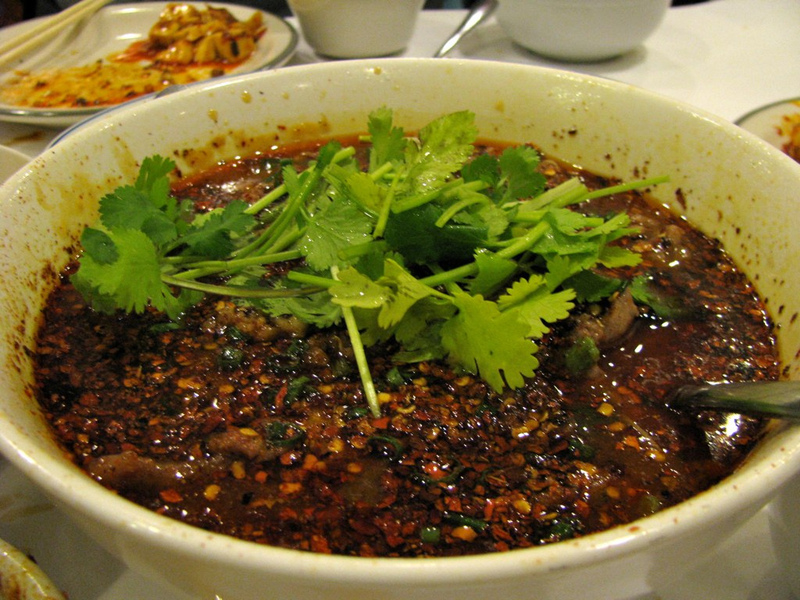 Since the capital of Sichuan, Chengdu, is one of the end points of the Silk Road, Middle Eastern flavors such as cumin is very common in Sichuan cuisine. For this specialty dish, we were expecting lamb that was a little bit more dehydrated but with tender pieces of lamb and aggressive spicing, we weren’t complaining at all. The copious amounts of sliced garlic and green onions rounded out the flavors and Angela declared it near perfect. I was tickled pink when I noticed Sliced Beef in Fresh Hot Pepper. It’s one of my favorite Sichuan dishes and pairs perfectly with nothing more than a bowl of steamed rice. It’s really a one bowl meal: layers of napa cabbage, tender beef slices, and sometimes mung bean noodles all the way at the bottom. And despite its thick layer of chili oil, it’s not really that spicy, but very pronounced in ma la flavor. This dish also comes in a fish version and we can’t wait to try it! 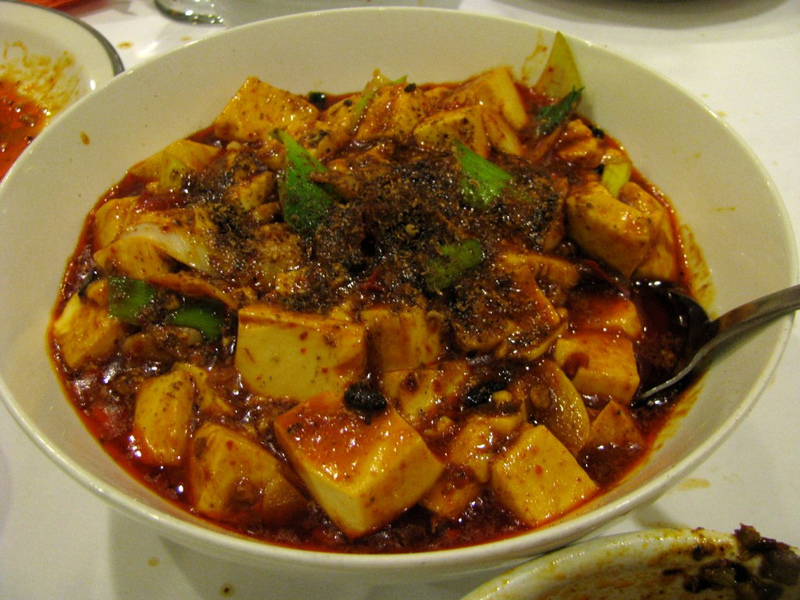 Ma po Tofu is another classic Sichuan dish that is often poorly executed elsewhere. This wholly vegetarian dish was the best version we’ve tried in town. Liberally sprinkled with cumin and peppercorns, the silken tofu was further complemented by garlicky thick cut leeks. 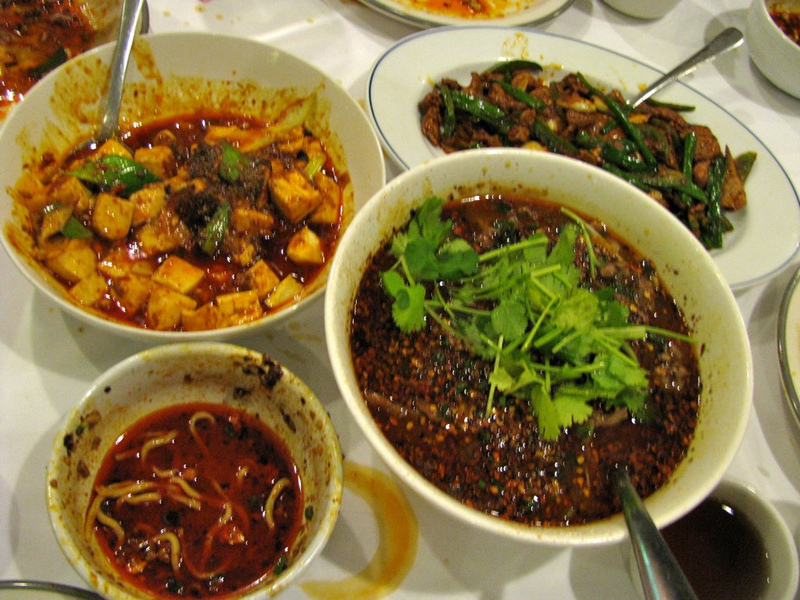 This photo sums up our selection of classic Sichuan dishes, heavy on red chili oil and utterly delicious. 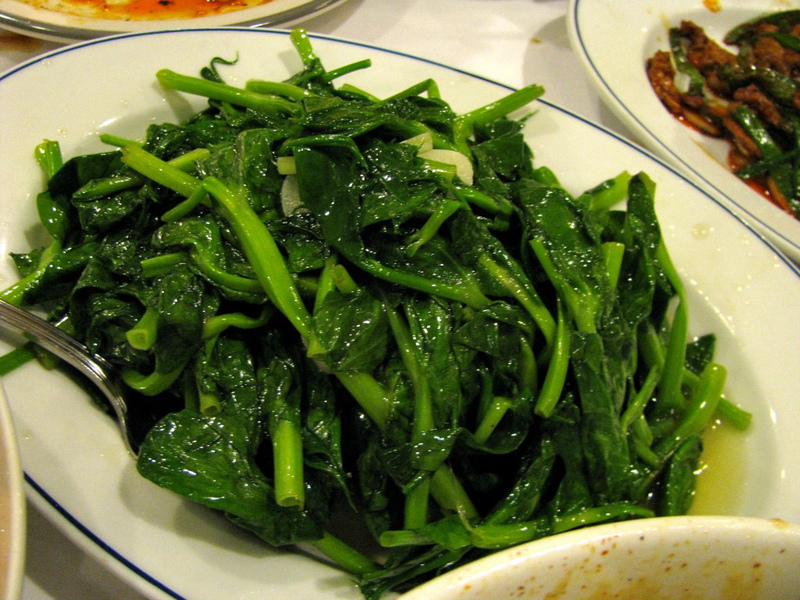 To round out our meal, we also shared a simple dish of pea shoots stir fried with garlic. Even in the best of kitchens, delicate leafy greens are so hard to execute consistently. At Fortune, the leaves were just barely cooked through, the stems still had a nice crispness, and it was not too oily. A true indicator of great skill. On our way out, we noticed that the new management had posted signs of their house specialties. We did well by ordering three of the eight, and we can’t wait to come back to try more! Left column, translated: Beef Tripe with Hot Pepper Sauce, Ma La Dried Beef (Beef Jerk with Red Chili Sauce), Diced Rabbit in Chili Oil, Ma La Beef Tendon (Beef Tendon with Red Chili Sauce). Right column: Ma Po Tofu, Fish Filet in Hot Pepper, Cold Beef with Spicy Sauce, Dan Dan Noodles. This entry was posted in Asian, Chinese and tagged Asian, Chinese, lamb, mala, peppercorns, Sichuan. Bookmark the permalink. Thanks for the tip on this place – looks like a winner! I’ve had so many dicey/unsatisfying encounters with strip mall Chinese places, it’s great to get a recommendation like this. Thanks for reviewing Fortune. They’re one of my favorites in town, and deserve all the publicity they can get. Some of the best Sichuan food you’ll find outside of Chicago or NYC. Coco’s Grill is worth a look, as well. Don’t be put off by the anonymous exterior and the Thai-Chinese menu. The ‘traditional Chinese dishes’ (I think that’s what they call it) portion of the menu is authentic home cooking, kind of like your grandma would make, if she was Chinese. 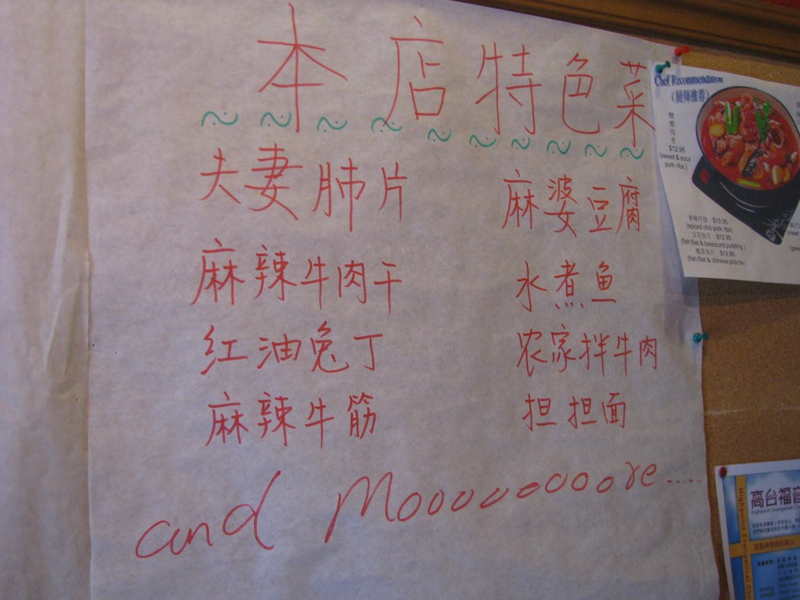 Plus there’s a markerboard in Chinese. 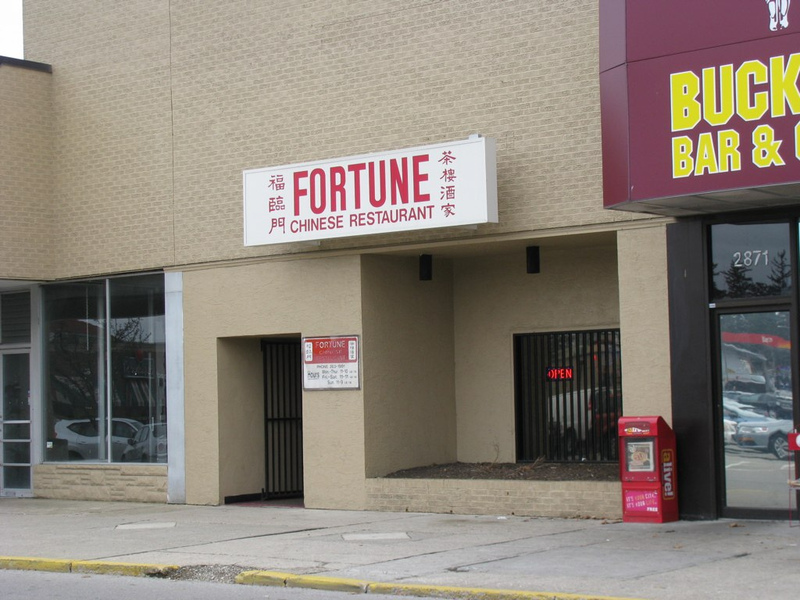 This is where all the Chinese grad students at OSU’s East Asian Languages & Literature eat (or so they tell me). Thanks for this, I’ll be trying this one next, looks really really tempting!! Thank you so much for blogging about this place, we went today and the food is to die for, quite spicy but so flavorful!! Besides the Dan Dan Noodles, I think my favorite app is the Lima Beans…so addictive!! I think their pea shoot preparation is my favorite of all the Chinese spots that offer them.